As of April 19, 2016, the National Park Service has closed the Mojave Road between Mile 27.0 and 30.5 in the Mojave National Preserve. This closure is due to a washout on the old underground telephone cable road connecting Piute Valley with Lanfair Valley. No date has been set for completion of repairs to the road. The National Park Service recommends a 29-mile bypass on their Web page. The Mojave Desert Heritage and Cultural Association, the publishers of the official Mojave Road Guide, have developed an alternate 14.2-mile detour for Mojave Road travelers who would prefer a shorter, more historic and scenic route. A PDF with a map and road log is available for download on the home page of their Web site, www.mdhca.org. 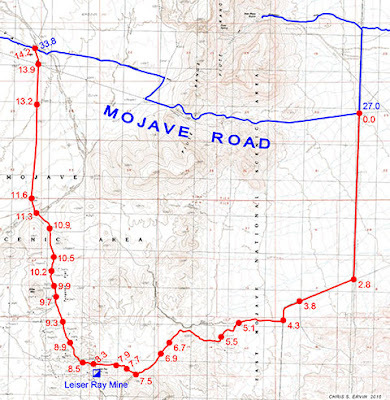 We created this site so there would be a place where enthusiasts can find information related to the Mojave Road. We are some of the many volunteers associated with the Mojave Desert Heritage & Cultural Association / Friends of the Mojave Road who help maintain the road for everyone to enjoy.